Doing laundry is easy, right? Just separate your lights and darks, pop in some laundry detergent, and you're good to go. Well, it can be a bit more complicated than that. Washing delicates? It's a whole other process. Trying to wash your trainers or bedding? Different again. And how do you choose the best laundry detergent? We answer all of these common questions, and more, in our guide to doing laundry. Once you're done, find the best washing machines in our guide. And... see all our cleaning how-tos and hacks to keep your home sparkling. Use our buyer's guide to the top 50 cleaning products to find the best laundry buys for your wash.
What is the best temperature to do laundry at? There is no hard and fast rule here. 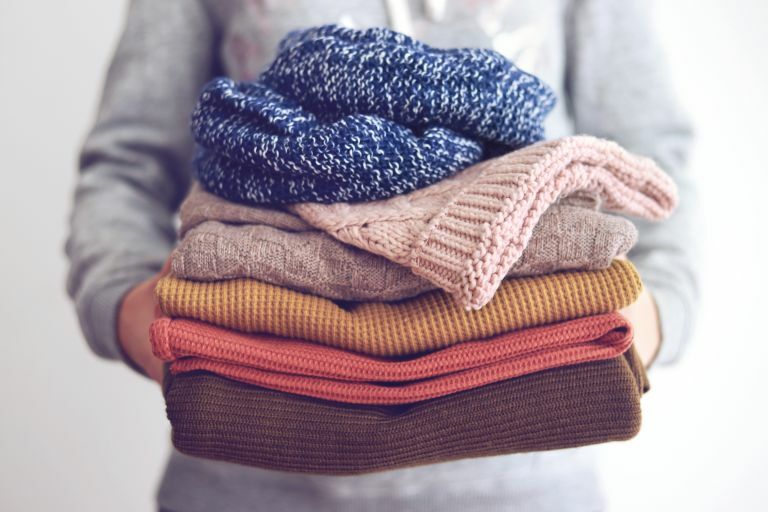 Of course, the easiest way to determine the temperature to do laundry at is to look at the clothing's care label, but a clothing label is only a guideline, so the temperature you choose for doing laundry should also depend on the exact fabric and garment type you're washing – and, to some degree, personal preference. If your main concern is the environmental impact of doing laundry, then 30ºC might be your default temperature. In fact, many newer, high tech washing machine models promise to get your clothes perfectly clean at lower temperatures; some very new models claim to get your clothes clean at as low as 20ºC. Having said that, if your washing machine is of standard quality, washing everything on 30ºC cycles may have unpleasant consequences, including bacteria growth on both your clothes and inside your washing machine. Towels and bedlinen need to be washed at 60ºC to ensure the proper elimination of bacteria. Whites also need to be washed on a 60ºC cycle at least occasionally, to prevent them from going grey. Sweaty gym kit? Again, 60ºC is a must, or you could be looking at dermatitis or acne. Delicate fabrics, on the other hand, should never be washed on anything higher than a 40ºC cycle. This includes not just silk and wool (more on those below), but also linen and organic cotton (apart from towels). If you constantly wash high-quality, organic cotton in high temperatures, you will begin to see pilling and a loss of shape. Colours will also fade if washed in hot water, so choose a 30ºC to 40ºC cycle. Dark colours should stay on a 40ºC cycle maximum. Yes, wool and silk can be laundered, but in the case of wool, it doesn't need to be laundered all that often, unless you're wearing a jumper on bare skin. Wool is naturally dirt- and bacteria-repellent, so you can safely wear that jumper again and again – just wear a t-shirt underneath. When it does come to laundering your wool items, wash them in cold water and using only a specialised detergent formulated for delicate fabrics. Anything above 30ºC is guaranteed to make your wool shrink. Silk can be washed safely in 30ºC, on a delicate (or special silk) cycle. Both wool and silk do badly on high spin speeds – at worst, a high-speed spin can tear the fabric; at best, your garments will come out wrinkled, which means having to iron them once they're dry (which is not great for these fabrics). Never tumble dry silk or wool, and don't hang wool to dry as it will lose its shape. Dry it flat instead. Use our guide to find out how to handwash clothes like a pro. Upholstery covers: when washing sofa or cushion covers, turn them inside out. Anything with a zipper should be zipped closed before it goes in. Stick to a cool wash for best results, checking the care label first to ensure that they can be machine washed and up to what temperature. You might also find that an upholstery cleaner will do the job more quickly, meaning you won't need to rely on a machine wash.
Find our pick of the best for keeping your sofa covers, cushions and throws looking as good as new. Curtains: especially net or voile, should be washed cold and hung up while still damp to prevent creasing. Check care labels, though, as some are best left to dry cleaners. Knowing how to do laundry puts washing bedding correctly near the top of any list. It is very important to wash your bedding, such as duvets and pillows, at least once every three months (more regularly if you suffer from allergies), in order to get rid of dust mites, skin cells, and sweat. The biggest problem with laundering bedding at home is that large items such as duvets may not fit into your washing machine. Don't try to cram it in if it really is too big – you'll end up with unwashed patches, and may have trouble getting the over-full machine to spin. Instead, take your duvet to the laundrette or use a professional laundry service. Don't dry clean your bedding. Pet bedding is best cleaned with a sticky roller first or, better still, a vacuum cleaner designed to pick up pet hair, to ensure that you don't end up with loads of pet hair clogging up your washing machine filter. Then it needs to go on a hot wash (60ºC) so that you can be sure that germs and dust mites have been killed off. Find out more about spot cleaning after dogs and the best ways to clean up after cats for more specific pet mess cleaning tips. Find the best vacuum cleaner to keep your home pet-mess free – we've reviewed the top buys. We are, of course, talking washing trainers or cotton loafers, not leather shoes. The answer is – usually, yes, but be very careful. One potential problem with washing shoes (one this author has had the misfortune to encounter) is that the shoes will accelerate the foaming of your detergent as they're being laundered, which can cause your machine to fill up with foam and malfunction. The other is that the soles of trainers can scuff the drum. To counteract these issues, add less detergent than you normally would, and use a lower spin speed. Your trainers will not look brand-new, but they will look brighter and fresher afterwards. Find more clever laundry hacks in our guide. You might not think so but you can wash cashmere yourself, but you can do so both in the washing machine or by hand. First start by pre-treating stains or spots on the cashmere with Belinda Robertson Wool and Cashmere Wash (always read the instructions first), then place your cashmere item into a mesh laundry bag, set your washing machine to the delicate or woollens cycle (but first read the care label to follow the manufacturer's advice), add more of the product (following the instructions for the amount) and set to go. Or, simply use it to wash the cashmere by hand, pushing the item under the cool water/cashmere wash mix, and gently moving it about in the water. If there is no colour run, leave it to soak for up to 30 minutes and then rinse thoroughly, being careful not to wring or stretch it. To dry the cashmere item, lay it flat. Towels and clothes: it may be tempting to chuck it all in together, but towels are made from tougher, thicker fabric than clothing and will basically be scratching it through the washing cycle. This will mean faster wear and tear of your clothes. Denim and other cotton: the same applies to your jeans. Denim is a specially processed, tough cotton fabric that is abrasive to softer items such as t-shirts. Underwear and outerwear: we're all guilty of this, but delicate underwear, and especially bras, should never, ever be put on the same cycle as your clothes. Bras will lose shape if washed with other items and on a high-spin cycle – even if you put them in a laundry bag. Underwear contains delicate elastic that will disintegrate quite quickly if washed on high temperature, high spin cycles. Always wash your delicates on a 30ºC, delicate cycle. Laundry mesh bags, which you can buy for washing delicate items such as bras, will stop socks going missing. Simply pop dirty socks into a bag and they'll all be present and correct at the end of the wash, too. Knowing how to do laundry if you are an allergy sufferer is vital. The number of people with skin allergies and eczema is on the rise, and some say that harsh laundry detergents are partly to blame. If you itch every time you get into bed after you've changed the sheets, or every time you put on a clean t-shirt, this may well be something to look into. Fragrance is by far the biggest culprit, so choose a fragrance-free detergent. Avoid fabric softeners, as they're always worse for high content of potential allergens. You'll also need to make sure you wash your bedding regularly and at 60ºC, as that's the only temperature that will kill allergy-causing dust mites. Washing powder or liquid laundry detergent? There is no real consensus on what type of laundry detergent is best: clothing manufacturers will tell you that liquid detergents keep your clothes in optimal condition longer, while washing machine manufacturers will point out that a powder detergent is far better for the washing machine itself, less likely to create buildup (especially in hard-water areas). In reality, however, any laundry detergent, whether it's powder- or liquid-based, is a combination of surfactants (the chemicals that actually do most of the cleaning), bulking agents, bleaching and foaming agents, and chelating agents or builders, which bind with the metals in your water and counteract the effect of hard water. Some detergents also contain enzymes that tackle stains of organic origin – these are the products labelled 'bio', and they can be great for family households with young children, but they won't be suitable for everyone, as they're known for triggering skin allergies in some people. From our experience, a good detergent is a higher-quality detergent, regardless of whether it's powder- or liquid-based. Many cheaper powder detergents contain lots of fillers, which do none of the cleaning and are responsible for build-up and streaks on your clothing. So, if you are on a budget but still want quality, we would advise going for a plant-based liquid detergent. More expensive powder detergents (organic brands in particular) exclude fillers and use only high-quality soap as their base. These are great, but don't come cheap. Avoid liquid detergent capsules and anything that goes directly into the drum (streaking and buildup highly likely). If there already is build-up in your machine, find out how to clean your washing machine in 6 easy steps. Contrary to popular belief, a 'dry clean only' label does not always have to be followed. All that such a label means is that the garment manufacturer hasn't tested the fabric for shrinking. So, it's best to interpret such as label as 'wash at your own risk' and then proceed according to common sense. There is no reason a silk garment can't be washed on a delicate, low-temperature cycle (see above). On the other hand, a complex composite fabric (say a wool, cotton, and synthetic mix) may react badly to being washed, since the different fibres used in the fabric will not expand and contract at the same rate, which can lead to a loss of original shape. This is why suits and coats are best taken to the dry cleaners. Of course, knowing how to do laundry to perfection starts with choosing a good washing machine. An old, inefficient machine will almost certainly give you poor results, even if you do everything right. If it's time for you choose a new one, consult our buyer's guides below, or find a washing machine deal in our latest buyer's guide. Finally, don't forget about washing machine maintenance. Run your washing machine on its hottest cycle once a month, with no clothes in it, and use our washing machine cleaning tips (above) to keep yours in top condition. Use our guide to find the best freestanding washing machine at the very best price. Get a streamlined look in your kitchen with an integrated washing machine – see our top pick. Putting a washing machine in an open plan kitchen diner? You'll want one that's quiet to run. Tumble dryers: should you use them? We say: if you can avoid them, and have the space for line drying and/or a dehumidifier, then don't use them. However, there's no doubt that tumble dryers can be handy for drying large, bulky items such as towels and bedlinen, and in houses or flats where the choice is between damp-smelling towels and a tumble dryer, the tumble dryer obviously is the better option. Just be prepared to replace any items you tumble dry sooner, as tumble drying does thin fabric after a while. If you do decide to get a tumble dryer, consult our buyer's guide to the 5 best tumble dryers for the modern home first. We've also reviewed the best washer dryers if you need to save space. Find out more, too, about why you might want to invest in a dehumidifier rather than a tumble dryer.